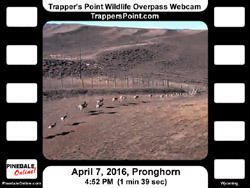 Activity you may see in this cam March/April: Path of the Pronghorn Thousands of pronghorn and deer moving in large and small herds travel northerly with spring green-up. See Video page for highlight clips. 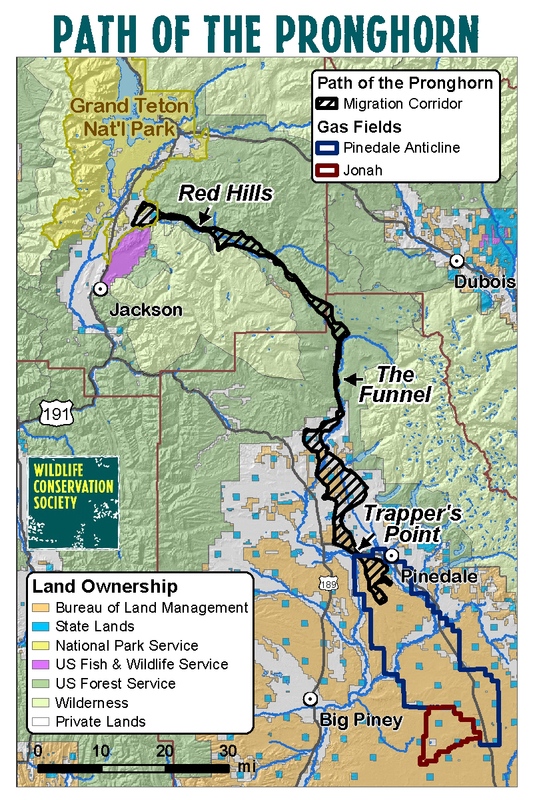 June/July: Green River Drift northern cattle migration Upper Green River Cattle Association ranchers will move cattle along a 58-mile long cattle trail to get them from spring pasture on the southern desert to summer pasture on the forest in the Upper Green. Timing depends somewhat on the weather. 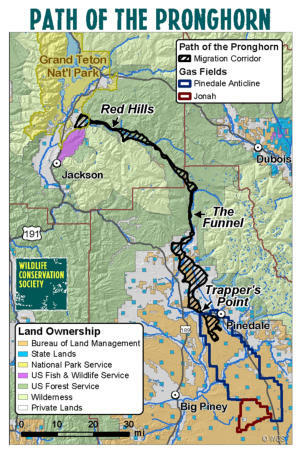 October: Green River Drift southerly cattle migration. Cattle will “drift” back south, collecting in the sorting grounds to the south of the overpass. Cowboys will sort the livestock by brand to go to their home ranches. Weather influences timing when things actually happen. October/November: Path of the Pronghorn southerly movement Thousands of pronghorn and deer in small and large herds move to winter range further south in the Green River drainage, crossing the overpass as they move through. It may take a minute or more for the live image to first load due to the cell phone and satellite connection and image buffering - thank you for your patience! The camera does a patrol every 3 minutes to switch between four position views (north, south, east and west), and may also be moved at any time by webcam administrators monitoring the camera activity. (If the screen view turns black while you are watching, just move your mouse a little bit over the cam picture to bring back the view. Because the live feed uses cell phone and satellite links with the webcam, the server monitors the viewer's mouse on the screen link and will disconnect the connection to the live view if it detects user inactivity in order to save bandwidth and keep operating costs down.) The pronghorn and deer travel through in small to large groups, and it may be minutes to hours between them. The deer often linger and eat while nearby. 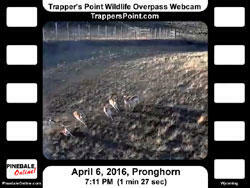 The pronghorn tend to pass through fairly quickly, moving together almost like a school of fish, and frequently running across the overpass. Herds may be seen crossing over the bridge in both directions, but in the spring mostly going north, and in the fall mostly moving south. At times other wildlife might also be seen on the overpass bridge, as well as cattle during late spring and fall when the Green River Drift occurs. 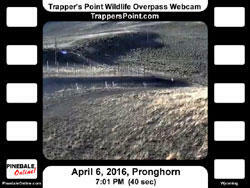 Pinedale Online is pleased to become the new manager of the Trapper's Point Wildlife Overpass webcam as of April 1, 2016. We are taking over from the Wildlife Conservation Society (WCS) which is wrapping up their Path of the Pronghorn Interpretive Site project and grant funding. Wildlife Conservation Society researchers have been studying the Path of the Pronghorn since 2003. In 2008 the Path of the Pronghorn became the first federally designated migration corridor. 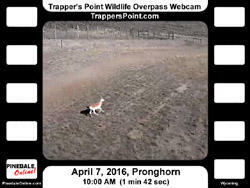 The Trappers Point Wildlife Overpass webcam provides a unique opportunity for the public to directly observe pronghorn and other species moving across the overpass. WCS has partnered with many other organizations to design and install an informative interpretive site along US 191 approximately a mile east of the overpass that provides information about the pronghorn migration and the infrastructure investments that have been made to conserve these migratory movements. WCS's project will be complete with the ribbon cutting ceremony on April 13th for the new interpretive site. Pinedale Online is currently in the process of learning the camera set up and making adjustments, so please bear with us as we continue to make some modifications over the next several weeks to both the camera view and this page. Since the system operates using a cell phone and satellite connection, bandwidth costs make it not possible to allow the public to have access to control this webcam to change the views. The camera is made possible by technology and maintenance by LiveView Technologies, which operates and maintains many of the WYDOT highway cams across Wyoming, as well many other web cameras. 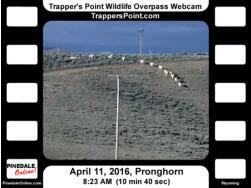 The Trapper's Point Wildlife Overpass camera administrators include Pinedale Online and wildlife biologists with WCS. The camera view may change out of the programmed patrol sequence at times by administrators who are controlling the camera. 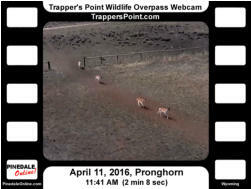 It is important to allow wildlife biologists and researchers to continue to have access to the web camera in order to not disrupt their studies of the pronghorn movement patterns. 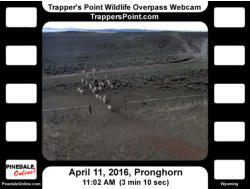 Click on the links below to see recent video hightlights from the Trapper’s Point Wildlife Overpass webcam. 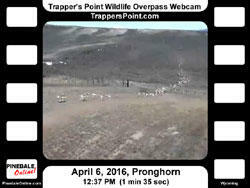 These sponsors are helping to make the webcam data available for wildlife biologists to continue their research of the pronghorn migration. Sponsorship is $100/month. Special first time sponsor rate of $50 for the first month. Call 307-360-7689 for more information about sponsoring, or email support@pinedaleonline.com. Thank you! It may take up to a minute or more for the cam to first load - thanks for your patience! This camera uses a satellite and cell phone connection. It may be minutes to hours between herds during migration times (spring/fall) - herds move through in both directions. If your screen turns black while watching, move your mouse a little to reconnect. The camera moves to programmed location settings every few minutes. Camera administrators may move camera as well if logged in and monitoring camera view. Check the video highlights below and clips on the Video page for action of animals crossing the wildlife overpass.